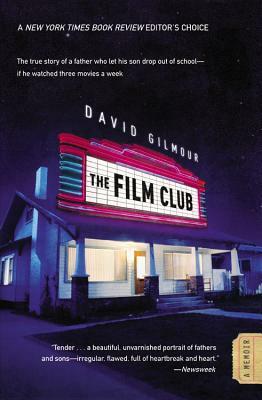 "I loved David Gilmour's sleek, potent little memoir, The Film Club. It's so, so wise in the ways of fathers and sons, of movies and movie-goers, of love and loss." "If all sons had dads like David Gilmour, then Oedipus would be a forgotten legend and Father's Day would be a worldwide film festival." At the start of this brilliantly unconventional family memoir, David Gilmour is an unemployed movie critic trying to convince his fifteen-year-old son Jesse to do his homework. When he realizes Jesse is beginning to view learning as a loathsome chore, he offers his son an unconventional deal: Jesse could drop out of school, not work, not pay rent - but he must watch three movies a week of his father's choosing. Through their film club, father and son discussed girls, music, work, drugs, money, love, and friendship - and their own lives changed in surprising ways. David Gilmour's sixth novel, A Perfect Night to Go to China, won the 2005 Governor-General's Award for fiction in Canada and has been translated into Russian, French, Thai, Italian, Dutch, Bulgarian, Serbian and Turkish. China and a previous book, Lost Between Houses, were both nominated for Ontario's Trillium Book Award. His novels have been praised by visionaries from William Burroughs to Northrop Frye, and in publications ranging from People magazine to the New York Times Book Review. Gilmour worked for the Toronto International Film Festival before moving into a broadcasting career with the Canadian Broadcasting Corporation (CBC) where he served as the national film critic for country's flagship news show, The Journal. He went on to host his own talk show on CBC's Newsworld, Gilmour on the Arts, which won a Gemini Award. Gilmour's 5,000-word memoir of reading Tolstoy ("My Life with Tolstoy") appeared in last summer's issue of The Walrus magazine (the Harper's of Canada) to huge response and acclaim.